Typed letter, signed "Ogden Nash"
New York, 1957. One page. 1 vols. 4to. To Wesley Hartley, a long-time educator and teacher, formerly of the American Council on Education. Folded, else fine with the original envelope. One page. 1 vols. 4to. "college education amounted to nothing". 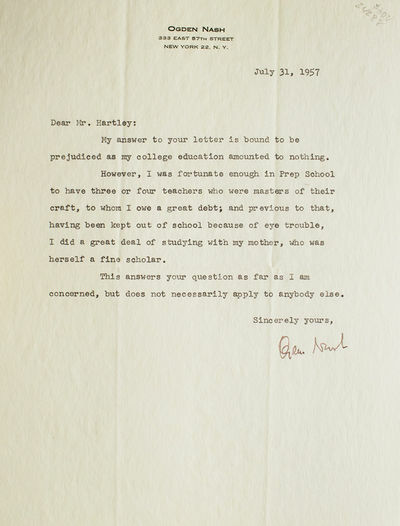 To Hartley's question as to the influence high school and college had on his writing Nash replied "my answer to your letter is bound to be prejudiced as my college education amounted to nothing...I was fortunate enough in Prep School to have three or four teachers who were masters of their craft, to whom I owe a great deal." He concludes "This answers your questions as far as I am concerned, but does not necessarily apply to anybody else."